I’m running a small test, on knowledge level, and I would appreciate your help. I’m using a Dragino Hat v1.0 on my raspberry pi, configured as a single channel “gateway”, and a TTGO T-Beam as a end node, configured to send GPS data to TTN through the hat. I’ve got dio1 connected to pin 33 on T-Beam. I believe there may be a wrong parameter somewhere but I’m having a hard time to find anything about this error. If there’s anything else I need to inform, please let me now. Thank you very much for your attention so far. You are using a single channel gateway and a multichannel node. The node changes channel every transmission So not all transmissions are received by your gateway. Solution could be to edit the channels in your node So that they are all the same and equal to the channel on your gateway. The first byte 0x79 is binary %01111001, where the first 011 denotes an unconfirmed downlink, not an uplink. And 0xD9 is %11011001, where 110 tells you it’s reserved for future use. I guess that the error about the DevAddr is just caused by your decoder not knowing what to do. 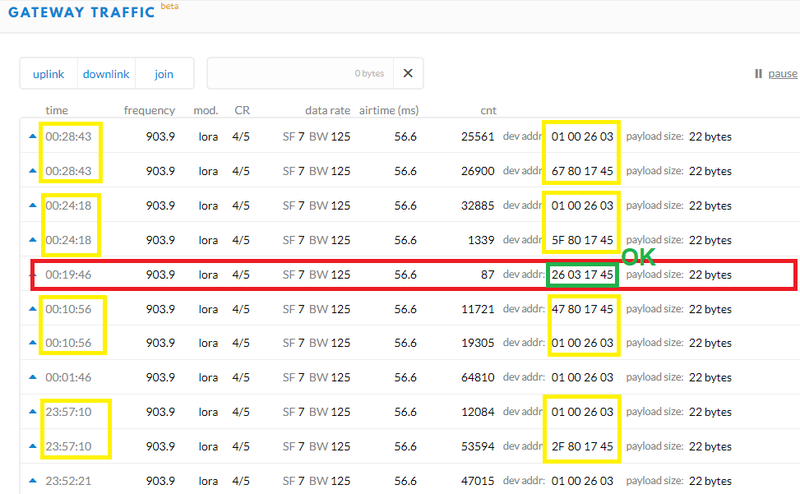 Maybe these are random LoRa (not LoRaWAN) packets not sent by your node at all; do you see the packets at the same time your node is sending? If yes, then maybe check the antenna, and increase the distance between node and gateway to avoid distortions. If there’s any other gateway around then it would be good to see what that one receives. Also, what length of the packet do you expect? Did the first packet even decode into something you expected? The 4 bytes after the header byte, 0x45170F26, seem to indicate it’s a TTN DevAddr, 0x260F1745, but it’s still a downlink… Due to “inverted IQ” a downlink from one gateway should not be received by other gateways, so if this is a downlink sent by another gateway, then maybe the IQ is wrong on yours? Assuming the problem could be the single channel gateway and multichannel node, I’ve tried to install bokse001/dual_chan_pkt_fwd/tree/dual_chan_pkt_fwd_up_down .Which is a fork of the single channel version for the raspberry pi LoRa Hat which turns the gateway into a dual channel gateway. But I’m confused about the frequencies and spreading factors I should use. Listening at SF7 on 903.900000 Mhz. Listening at SF7 on 905.300000 Mhz. I’m not sure about the value of the frequencies. Here in Brazil we support 902-928 MHz. Does that mean I could use 902 for channel 1, and 928 for channel 2, for example? I’m having trouble to understand this, I’ve only found examples using 868.1MHz frequencies. Anyway, I tried this method and the gateway received three 22bytes packets in about 30 minutes, the packets arrived through channel using 903.9 Mhz. I’m not sure this is a good result, I understand LoRa is limited, and that I’m using the cheapest gateway method, so maybe it is. without changing the frequencies of your node ? Yes, I haven’t changed. I also forgot to say I’m using ABP, if it is of any relevance on this scenario. It takes nearly 30 minutes uptime to receive the packet. It is also strange how from the moment I turn off the node, the gateway completely stops receiving any kind of packets. Not just the packets destined to 26031745. The packets also seems they’re being sent in pairs (time field below) with different addresses. Which makes me believe these Device Addresses are being somehow “generated”(?). The dual channel code required mapping the same pins for both channels, this may be related. Please don’t post images for terminal output: that makes it hard to copy details. Anyway, the QAMmAAE4Kv1C1q1FF4AfMeChD17yoA== now nicely decodes into an uplink. However, it shows a huge counter value of 64,810. Given the different timestamps I also assume the terminal output and the screenshot of TTN Console are unrelated? Seeing data in TTN Console’s Traffic page doesn’t tell you much; that could even be plain LoRa (not LoRaWAN) from other sources. But if TTN Console shows the packet in the Application Data, then it used the secret NwkSKey to validate the Message Integrity Code, so chances are low that the packet was somehow distorted then. When you also see the expected decoded application data (like shown in the screenshot) then you can also assume that the secret AppSKey is okay. So, the packet for the screenshot seems very fine, but the packet from the terminal output (seeing the huge counter) might be erroneous after all. So, it’s safe to assume that all packets you see are indeed generated by your node. You should also be able to tell as you know when the node is sending? That by itself is not a problem. Yes, if you don’t make the node only use the frequency that the gateway is listening to, then you’ll not receive all packets. But when a packet is sent on the expected frequency and SF, then it should be received just fine. I’ve increased the distance between them, and the result was positive, that surely was an issue before. 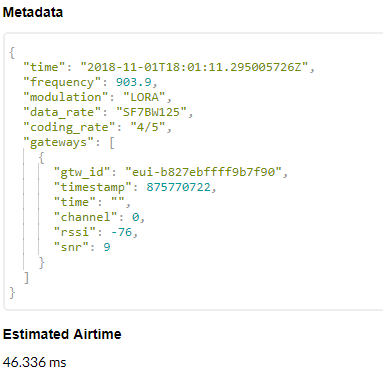 Analyzing the packet logs on gateway, I’ve realized the packets had a fixed 4 minutes interval, and from the node perspective, I can see packets via serial monitor. see Can LMIC 1.6 be set up to use a single channel and SF?